Cows have dark brown coats with white spots and black hooves. Their eyes are larger than those of most mobs and appear somewhat unfocused. They resemble Norwegian Red Cattle. Female cows have a short horn on either side of their head and a pink udder. Male cows have more pronounced horns and no udder. 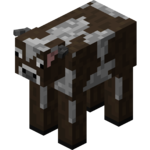 Cows provide more types of useful resources than all other passive mobs and can be used to provide the player with an unlimited supply of meat, milk, bones, and hide. Female cows can be milked once a day by the player. This is done by holding a Wooden Bucket and right-clicking on the cow’s udder. Cows are passive to the player and will not attack under any circumstances, though like all passive mobs, it may turn to look at the player if the player comes near. An adult cow will follow the player if he/she is holding wheat grain, which is used for breeding, even if attempting to do so could prove deadly to the cow. If attacked, they will jump wildly and emit a cry of pain before trying to flee by running around erratically. Shortly after, the cow will become calm again and resume its idle wandering. Cows can be bred with all grains except rice. Unless they are separated, calves will follow their parents or other adult cows until they become adults themselves. A calf looks similar to an adult cow, but its body is smaller and it does not have any horns. Calves also move more quickly and make higher-pitched noises than adult cows. They take 3 months to fully grow into adulthood. This page was last modified on 6 November 2014, at 19:59.